Soap is a pointing device based on hardware found in a mouse, yet works in mid-air. 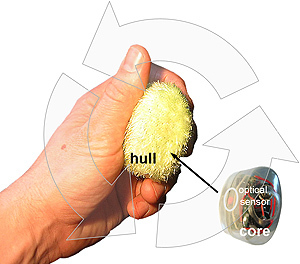 Soap consists of an optical sensor device moving freely inside a hull made of fabric. As the user applies pressure from the outside, the optical sensor moves independent from the hull. The optical sensor perceives this relative motion and reports it as position input. Soap offers many of the benefits of optical mice, such as high-accuracy sensing. Its used for a variety of application scenarios, including wall display interaction, Windows Media Center, slide presentation, and interactive video games.